SCVHistory.com | William S. Hart | Fannye Bostic Guest in Bill Hart's Cabin And Finds it Adorable, 1923. Fannye Bostic Guest In Bill Hart's Cabin And Finds it Adorable. Muskogeean Visiting Movie Star's Ranch Stays Over Night in Visitor's Cabin. The (Muskogee, Okla.) Phoenix | Sunday, September 16, 1923. This story gives us a highly detailed description of a cabin that no longer exists on William S. Hart's Newhall property, along with some insight into Hart's taste in decorating. We don't know who Fannye Bostic is, or how she knew Hart, or who the "we" is in the story. (Her young son?) Fannye had just turned 34 and was 25 years Hart's junior. One will note that Hart's sister Mary was already living on the property. 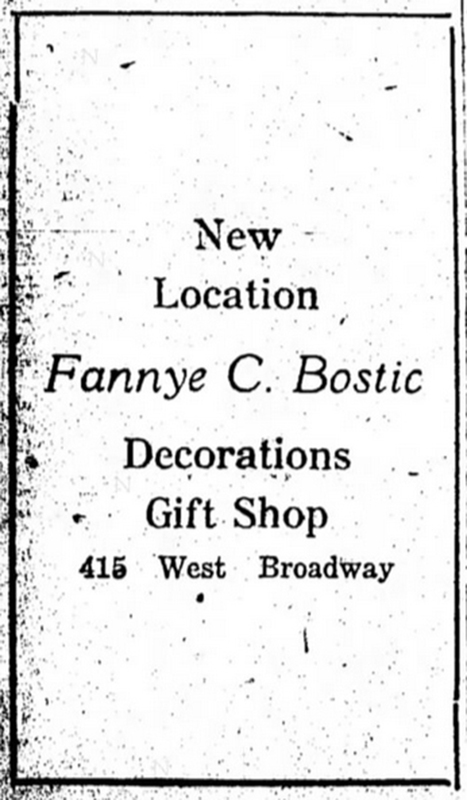 All we really know is that Fannye C. Bostic was born in Mississippi on Aug. 26, 1889, and died Dec. 1, 1977, either in Laguna Niguel or Beaumont, Calif. 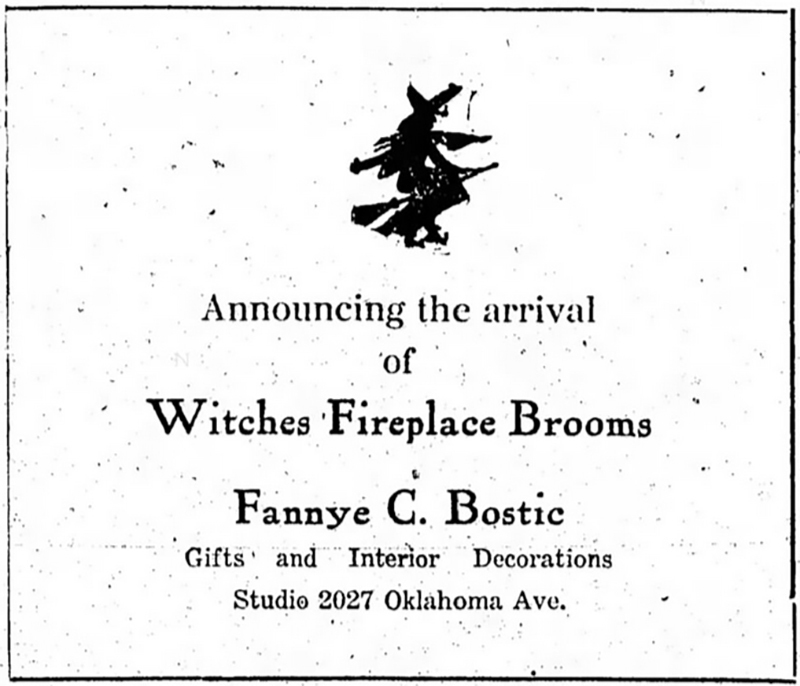 In between she lived in Oklahoma where she gave birth to a son, John E. Bostic, about 1917, and ran a gift shop in Muskogee. 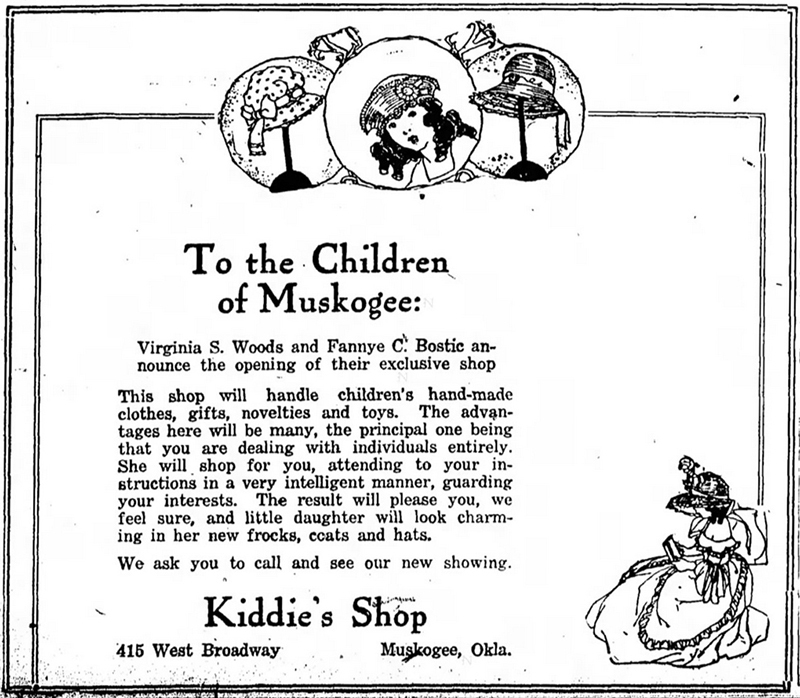 It might have been rough going; within a span of a few months in 1920 she was selling odd items at the shop, then she relocated it, and then she partnered with another woman to sell children's apparel and toys. Perhaps the fact that she sold "interior decorations" gives us a clue as to why she was so observant of the interior design of Hart's guest cabin. At some point she moved to California where she obtained her Social Security card. 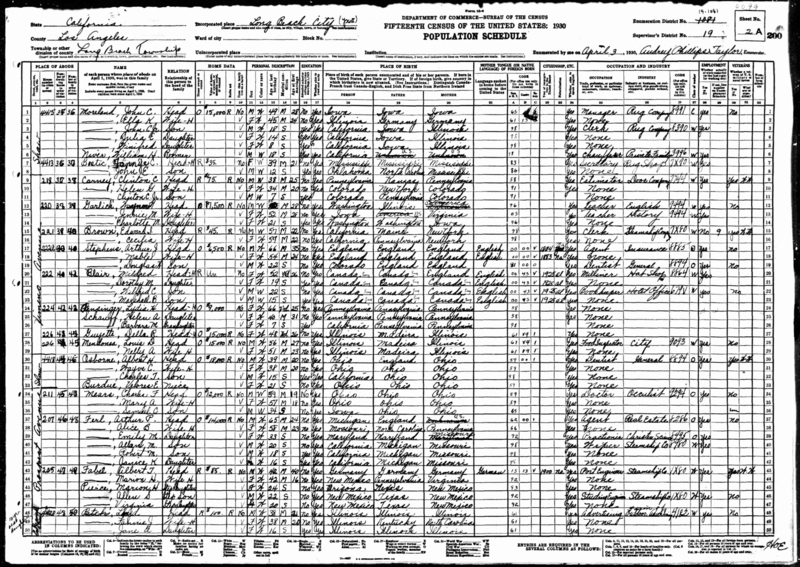 The 1930 U.S. Census lists her as married, but it also identifies her as head of household and shows her living alone with her 12-year-old son in a $35-a-month apartment in Long Beach and working as a secretary in a rug shop. Fannye C. Bostic, of Muskogee, who is now in California, recently was a guest at the country home of William S. Hart, famous "two-gun" man of the movies. In the following article written for the Phoenix she describes the guest cabin at "Horseshoe Ranch:"
After dinner and a pleasant evening gathered around the cheerful wood fire in the living room at the ranch house [there was no mansion in 1923 — Ed. ], listening to the thrilling experiences and hazardous incidents he had encountered since taking up the work in western pictures, our host, Bill Hart, announced he had another thrill in store for us. "You must follow the trail by lantern light," he seriously said, as he picked up an old lantern, biding us follow as he led the way out through a side door. Muskogee (Okla.) Times-Democrat, Jan. 17, 1920. Muskogee (Okla.) Times-Democrat, March 18, 1920. Muskogee (Okla.) Times-Democrat, May 5, 1920. The trail led out through several gates, past the servants' quarters, on across a hill, down through the oat field for a quarter of a mile, and there in the shelter of a white oak tree (which has been shot many times for the films, and under whose branches Fritz the pinto pony told his story of life before the camera to his sweetheart Kate, and his partner Lizbeth, the mule) stood a little cabin. "You are the first guests to occupy the cabin," Mr. Hart said, as he opened the door, switched on the lights and invited us in. "Now, folks, I bid you good-night. Come to the ranch house for early breakfast, or you may enjoy cooking it here whenever you like." Occupied by Mexicans when Mr. Hart bought the ranch, the small weather-boarded house with a low porch extended across the front, had been remodeled and converted into a guest cabin. There had been no attempt to glorify the outward appearance, other than a fresh coat of grey paint to harmonize with the interior. The walls of composition board and the wood work throughout the house had been painted a soft grey, with a silvery glint, the color of the mist that floats over the mountains at dawn. The living room, through which we entered, was a most informal and inviting sort of a room, with gay curtains of yellow checked ginghams ruf [part of sentence missing] ted wicker desk stood near a sunny window. Lamps with gingham shades, bowls of flowers, a fernery of growing plants and many interesting pictures of the movie star from admiring fans from all parts of the world, created an air of intimacy and charm. The [?] room and breakfast nook combined connected the living room. Here a built-in corner cupboard contained exquisite mauve lustre china, complete sets of linens and silver. A large wicker table held copies of late magazines. A blue bowl filled with fresh fruits, scrap books, poems, and songs that had been dedicated to the star. An inviting sofa had been placed near the table, where one could spend many interesting hours. Yellow ginghams were used for curtains and candle shades, while a single rag rug covered the floor. Two steps down to the most adorable kitchen. Who could resist the temptation to get breakfast in such a delightful place? The casement windows were curtained with blue and white checked ginghams, and a blue and white linoleum covered the floor. Built-in cupboards held almost every conceivable kitchen necessity, (mostly in blue enameled ware) and complete stock of fresh groceries. Racks above the sink held blue and white tea towels. A gaily decorated dust pan, broom and mop occupied an important place near the blue and white stove, as though inviting one to use them. Twin beds, dressing table and chairs which furnished the dainty north bed room were of ivory wicker. Pink checked gingham curtains hung at the windows and made the bed spreads. Rag rugs in blue were placed beside the beds. In the south bed room, the sort that would appeal to a man, stood an old curley red wood bed made by a Forty-niner, with quaint coverlets of blue and white. Ginghams in blue and white made the curtains and cushions in the big arm chair near a window that commanded a splendid view of the distant mountains. This room adjoined the bath. Here convenience and beauty had been combined in making a perfect "modern" bath room. Airy blue and white curtains hung at the casement windows. Truly it was a haven where one could spend Sunday morning in bed with or without breakfast as desired. Sunday is no exception so far as rising is concerned with Bill Hart. He is up with the sunrise, and after a long walk over the foothills with his faithful dog Congo, a visit with King, the foreman of the ranch, Fritz (the pinto pony), Kate, [Lizbeth] and Yucca Sal, he is ready to join his sister Mary at breakfast. Needless to say we enjoyed getting our breakfast, and are waiting the opportunity to sign our names on the register at the guest cabin again in the near future. News story courtesy of Becki Basham. 1930 U.S. Census page, Long Beach | Click image to enlarge.